Joint Atmosphere Product files are stored in Hierarchical Data Format (HDF). HDF is a multi-object file format for sharing scientific data in multi-platform distributed environments. HDF files should only be accessed through HDF library subroutine and function calls, which can be downloaded from the HDF web site. Each of the parameters listed below is stored as a Scientific Data Set (SDS) within the HDF file. There are two sets of geolocation arrays in the Joint Atmosphere product. The first (default) set is for the 5-km resolution parameters, which are derived from the Water Vapor (05_L2), Cloud (06_L2), Profile (07_L2), and Cloud Mask (35_L2) products. These 5-km geolocation arrays have the Scientific Data Set (SDS) names: Latitude and Longitude. The second set is for the 10-km resolution parameters, which are derived from the Aerosol (04_L2) product. These 10-km geolocation arrays have the SDS names: Latitude_10km and Longitude_10km. Users should ensure they are using the correct geolocation array when working with various parameters in the file. Description: Latitude for 5-km parameters. Notes: For reduced file size, Real*4 source data are repacked as Integer*2. A precision loss of 1/1000th of a degree results. Description: Longitude for 5-km parameters. Description: Total column precipitable water vapor (cm) for clear sky (bright land and sunglint ocean only) using near infrared retrieval. Notes: Source data at 1-km is subsampled at 5-km. Clear sky data are collected by using the Surface Type Flag in the 05_L2 SDS Quality_Assurance_Near_Infrared. Flag values of 0 (bright land) and 3 (ocean glint) only are used to pass data through to array. SDS name changed to clarify aggregation. Description: Cloud top pressure (hPa) at 5x5 1-km pixel resolution using infrared retrieval methods. If less than 4 out of the 25 1-km pixels are cloudy (cloud fraction < 16%), then the 5x5 km area is processed using the "clear" retrieval path and cloud top pressure is set to missing (fill). This is done because CO2-slicing is not sensitive enough to give an accurate cloud top pressure when the cloud fraction is less than around 15%. Notes: Data duplicated exactly from source file. Description: Cloud top temperature (K) at 5x5 1-km pixel resolution using infrared retrieval methods. If less than 4 out of the 25 1-km pixels are cloudy (cloud fraction < 16%), then the 5x5 km area is processed using the "clear" retrieval path and cloud top temperature is set to missing (fill). This is done because CO2-slicing is not sensitive enough to give an accurate cloud top pressure, from which temperature is derived, when the cloud fraction is less than around 15%. Description: Cloud fraction at 5-km derived from 1-km cloud mask (5x5 1-km pixel resolution) using solar and infrared tests. Fractions are computed as: [(count of lowest 2 clear sky confidence levels, cloudy & probably cloudy) / (total count)]. Notes: Data duplicated exactly from source file. Due to computational characteristics, cloud fractions are typically computed in 4% increments [0%, 4%, 8%, ... 96%, 100%], the exceptions are in areas where 1 or more of the 5x5 1-km cloud mask pixels contain missing data or fill (in other words, invalid cloud mask values -- for example in severe sun-glint regions like the Gulf of Mexico in June). Only cloud fractions of 16% and above will have corresponding non-fill cloud top pressure and cloud top temperature data associated with them (see Cloud Top Pressure and Temperature Description fields, above). Description: Cloud Phase as determined by the UW Infrared algorithm. Description: Cloud optical thickness at 0.66 µm derived from a two-channel retrieval using MODIS band 7 and either band 1, 2, 5. Notes: Source data at 1-km is subsampled at 5-km. Note that all cloud phases (liquid water, ice, and undetermined phase) are represented in the parameter; users must read the Cloud Phase (Retrieval Processing Path) Flag in the Cloud_Quality_Assurance SDS to determine the cloud phase represented by each pixel. Description: Cloud Optical Thickness Relative Uncertainty (Percent). Description: Cloud particle effective radius (µm) derived from a two-channel retrieval using MODIS band 7 and either band 1, 2, 5. Description: Cloud Effective Radius Relative Uncertainty (Percent). Description: Column Cloud Water Path two-band retrieval using band 7 and either band 1, 2, 5. Description: Cloud Water Path Relative Uncertainty (Percent). Description: Column Cloud Water Path two-band retrieval using band 7 and band 6. Description: Cloud Phase as determined by the Cloud Optical Property algorithm. Note that this phase flag is identical for both the primary retrieval and the 1.6/2.1 µm retrieval. 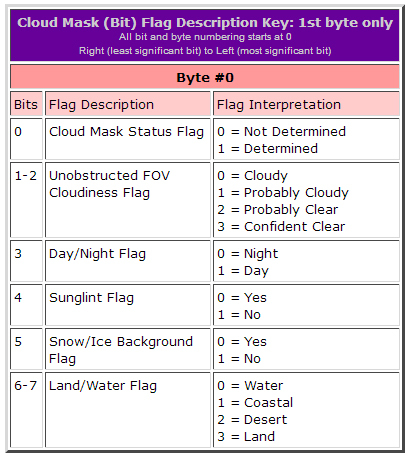 Description: Cloud Optical Property QA Flags. Notes: Source data at 1-km is subsampled at 5-km. The complete Collection 6 9-byte QA Flag array is copied from the source (input) SDS. SDS name changed to clarify application. Note that for Collection 004 this array was only 1 byte in length and contained only 4 flags. For Collection 005 this array was expanded to 5 bytes in length and set to match the source C5 SDS ("Quality_Assurance_1km" from 06_L2) exactly. For Collection 006, this array was expanded to 9 bytes in length and set to match the source C6 SDS ("Quality_Assurance_1km" from 06_L2) exactly. Key: For help reading QA (bit) flag arrays, review the QA Plan. Description: Cirrus reflectance at 0.66 µm. Notes: Source data at 1-km is subsampled at 5-km. Description: Total column precipitable water vapor (cm) for clear sky using infrared retrieval. Notes: Data duplicated exactly from source file. SDS name changed to clarify application. Notes: Source data at 1-km is subsampled at 5-km. Only the first byte is copied from the source (input) SDS. The first byte contains six QA flags. Key: For help reading QA (bit) flag arrays, review the Bit Interpretation information at the bottom of the FAQ Data Logistics page. Description: Latitude for 10-km parameters. Notes: For reduced file size, Real*4 source data are repacked as Integer*2. A precision loss of 1/1000th of a degree results. SDS name changed to clarify application. Description: Longitude for 10-km parameters. Description: Solar zenith angle (cell to sun) for 10-km parameters. Description: Sensor zenith angle (cell to sensor) for 10-km parameters. Notes: New angle parameter computed from input sensor and solar azimuth angle data. Description: Aerosol optical depth at 0.55 µm over land (corrected solution) and ocean (best solution). Description: Ratio of small mode optical depth to all modes at 0.55 µm over land and ocean. Description: Solution number index (1 through 4) for small aerosol particles (average solution only) over ocean. Indices of ocean models 1 through 4 correspond to accumulation (small) mode models with effective radii 0.10, 0.15, 0.20, 0.25 µm, respectively. Notes: Data packed from Int*2 in source file to Int*1 to save space (causes no data accuracy loss). Only the 2nd (average) solution is kept. SDS name changed to clarify application. Description: Solution number index (5 through 9) for large aerosol particles (average solution only) over ocean. Indices of ocean models 5 through 7 correspond to coarse (large) mode models of marine (sea salt) particles with effective radii 1.0, 1.5, 2.0 µm, respectively. Indices of ocean models 8 and 9 correspond to coarse (large) mode models of mineral dust particles with effective radii 1.5 and 2.5 µm, respectively. Notes: Data packed from Int*2 in source file to Int*1 to save space (causes no data accuracy reduction). Only the 2nd (average) solution is kept. SDS name changed to clarify application. Description: AOT at 0.55 micron for land (corrected) with all quality data (Quality flag=1,2,3). Description: Deep Blue Angstrom Exponent for land (0.412-0.47 micron) with all quality data (Quality flag=1,2,3). Description: Deep Blue Single Scattering Albedo at 0.412 micron for land with all quality data (Quality flag=1,2,3). Description: QA flags for (deep blue) aerosol retrievals over land. Notes: First populated in C006. Description: QA flags for aerosol retrievals over land and ocean. Notes: Only six bits gleaned from two QA arrays in the source (input) 04_L2 HDF file are set. SDS name changed to clarify application.